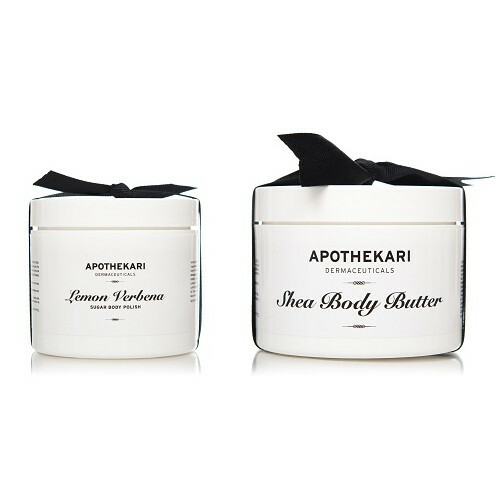 Body Polish Set: Shea Body Butter & Lemon Verbena Sugar Body Polish. Two of our customer favorites combined in one set for you. This body duo makes for a perfect bath time indulgence and is also a way to pamper someone special. Plus, the combination set is saves you 10% compared to buying the two individually! Apothekari Shea Body Butter is infused with healing herbs, fresh oils, natural vegetarian waxes and an intoxicating blend of essential oils to heal dry, cracked and callused skin. This extra-rich, protective crème is made with the highest quality organic shea butter from Africa. It penetrates deeply to heal dry, cracked, and callused skin and is also excellent as a daily hand crème, aiding in the health of cuticles and nails. Apothekari Lemon Verbena Sugar Body Polish has a bright, aromatic citrus scent and is ideal for aromatherapeutic body treatments or a little pampering in your bath. Unlike most sugar-based scrubs, our body polish is smooth and never drips excess oil, so it’s easy to apply. Made with a base of shea and olive fruit butters combined with virgin coconut oil, this body exfoliator has a unique emulsified texture.